I’m a member of the eBay Partner Network and was provided a sample from eBay at no charge for the purpose of this review. All thoughts and opinions are my own. My oldest became interested in archery after watching Brave, so much so she asked for her very own bow and arrow. I had seen Nerf Rebelle when it came out but she was far too young at that time. 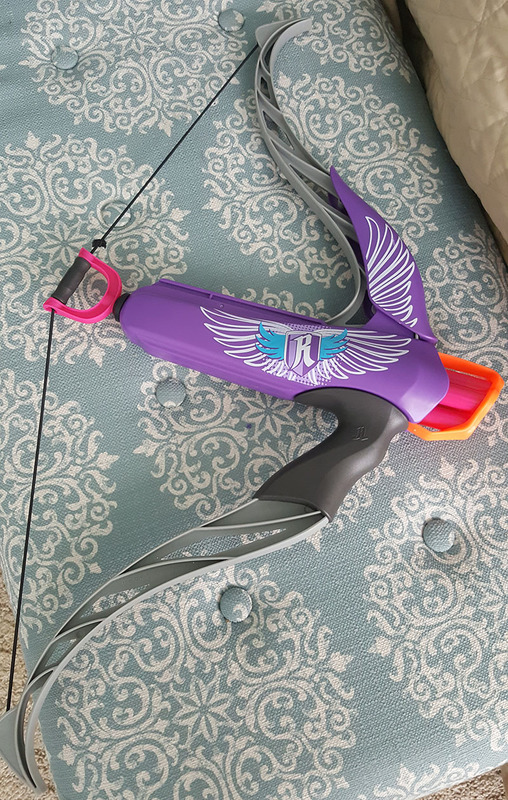 Now, she’s nearly six so I thought it was a great time for her first Nerf toy that also happens to be a bow and arrow she wanted so badly. The Nerf Rebelle Secrets And Spies Strongheart Bow Blaster is a toy bow and arrow that holds up to 4 Nerf darts at a time and can blast a dart up to 75 feet without having to reload. It comes with the blaster, 4 darts, decoder, and instructions It is perfect for my 5 year old since it works just like a bow and arrow but with a soft Nerf dart instead of an actual arrow. Plus, the darts can hold secret messages for your friends, which is great for encouraging my daughter to write. She’s learning to write in school and loves being able to write her own little notes and put them in her darts for secret messages. It is easy to operate, even though it says it is for ages 8 and up my younger daughter can easily pull back on the bow and launch the darts far. There is a nice large handle that is easy to grab onto and pull the bow back and release to shoot the darts. You do have to be careful to push the darts all the way back into the holder or they will not launch properly. She caught on quick with it and has been having a blast using her very own bow and arrow. It has been great for her imagination as she creates her own scenarios where she has to rescue someone or go on other super secret missions. The darts can get lost easily and after a while they do get a bit worn but you can purchase extras for them in all sorts of fun colors and patterns. My daughter also loves the purple color (her favorite) with the pink accents. This toy is a great way to let her have her fun with a bow and arrow without the risk of anyone getting hurt. The darts are nice and soft and don’t hurt when you get hit with it so I don’t mind her and her sister playing together without because I don’t need to worry about them getting hurt. It is a great toy indoors and out and is perfect for summer outdoor fun! Now, we just need to get her sister one so they can play secrets and spies together. There is an entire line of Secrets & Spies gear and I think we’ll get her sister one before summer is here so they can run around in the backyard and go on missions together. The Nerf Rebelle Secrets And Spies Strongheart Bow Blaster Purple is available on eBay for purchase.